Give your afternoon tea parties the extra touch they have been missing with Creative Co-Op's charming 3 Tiered Serving Tray. This beautiful tiered serving tray features simplistic scrollwork designs around the edge of each level and is just the right size for decorating with floral arrangments for the next book club meeting or family visit. 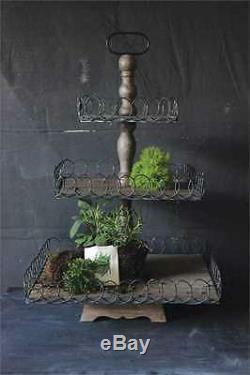 Measuring 26.75 inches tall, this 3 tiered serving tray features a wood build in a gray wash color. With a delicate, rustic design this wood tiered serving tray by Creative Co-Op brings a natural charm and beauty to any table setting. Dimensions: 16.5" x 26.75". The item "Creative Co-Op Wood 3 Tiered Serving Tray Square (DE1815)" is in sale since Tuesday, February 14, 2017. This item is in the category "Home & Garden\Kitchen, Dining & Bar\Dinnerware & Serving Dishes\Trays". The seller is "kitchene-ssentials" and is located in Springfield, Missouri. This item can be shipped to United States, Canada, United Kingdom, Denmark, Romania, Slovakia, Bulgaria, Czech republic, Finland, Hungary, Latvia, Lithuania, Malta, Estonia, Australia, Greece, Portugal, Cyprus, Slovenia, Japan, China, Sweden, South Korea, Indonesia, Taiwan, South africa, Thailand, Belgium, France, Hong Kong, Ireland, Netherlands, Poland, Spain, Italy, Germany, Austria, Russian federation, Israel, Mexico, New Zealand, Philippines, Singapore, Switzerland, Norway, Saudi arabia, Ukraine, United arab emirates, Qatar, Kuwait, Bahrain, Croatia, Malaysia, Brazil, Chile, Colombia, Costa rica, Dominican republic, Panama, Trinidad and tobago, Guatemala, El salvador, Honduras, Jamaica.